￼￼￼￼￼￼￼￼￼￼￼￼￼￼￼￼￼￼￼￼￼￼￼￼￼￼￼￼￼￼￼￼￼￼￼￼￼￼￼￼￼￼￼￼￼￼￼￼￼￼￼￼￼￼￼￼￼￼￼￼￼￼￼Thomas Barefoot may not be a household name, but any serious recording engineer has heard of his speakers, even if they have not had the pleasure of working with them. I first heard about Barefoot Sound studio monitors about five years ago. At the time, I had been using several different and well-known reference models, including ADAMs, Genelecs and B&Ws. While I was producing Green Day’s 21st Century Breakdown, Barefoot Sound sent me a pair of its MM27s to audition and I immediately fell in love with them; for the past five years, I have been using them as my primary studio monitors. I have a pair at my home studio—GrungeIsDead in Silver Lake, Calif.—and I have a floater pair that I’ve used on recent albums with The Foo Fighters, Garbage, Against Me!, and Never Shout Never. The MM27s have an incredibly clear and flat midrange, the bass response is full yet tight and focused, and they have a powerful dynamic range that rocks for both tracking and mixing. I love the way they sound, but more importantly, I trust the way they sound. 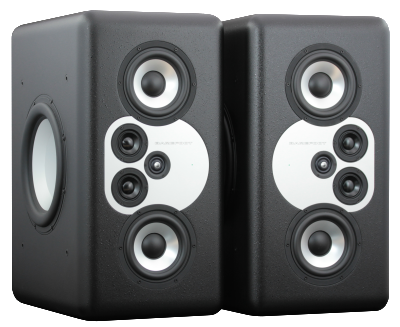 The MiniMain 12s are the company’s new flagship studio reference model. Thomas Barefoot has been pushing the envelope with his speaker designs for years, and with the MiniMain12 he’s added Voice Emulation. With the flip of a remote selector, the MM12s have the ability to switch between the state-of-the-art Barefoot sound and the classic sound of NS-10s and Auratones. I was curious to hear what the new 4-way system would sound like, if the voice emulations were the real thing or just hype, and how all the new tech would translate in a real studio setting. In the studio, I look for speakers that will double as large mains for tracking and as near-field monitors for overdubbing and mixing. I’m sometimes guilty of producing very dense tracks, so I need speakers that give me a flat, detailed midrange and open transparency in the high end. I’m used to working on three-way active near-field speakers, and was intrigued by the four-way active configuration. I love the midrange detail on my MM27s, so I was hoping the MM12s would sound even better. The seven active drive units, all housed in separate sealed enclosures, have a frequency response that, on spec, looks pretty flat: 20 Hz to 45 kHz (± 3dB) and 28 Hz to 40 kHz (± 1dB). The bass response also looks solid at -3dB@20Hz, Q = 0.707, slope=12dB/octave. There are four settings with the Voice Emulation: Flat, which the user’s manual describes as “the optimal setting for accuracy, transparency and most neutral translation.” The Hi-Fi setting doesn’t seek to emulate a particular speaker—the midrange “is a bit scooped [approximately -1 dB at 4 kHz] and highs are little accentuated [approximately +1 dB at 12 kHz].” The Old School setting “emulates the frequency, phase and transient response, along with the dynamic compression and distortion signature, for the NS-10M paired with a ‘3B’ type amplifier.” The Cube setting mimics the Auratone 5C, also run through a “3B” type amplifier. I like working in large control rooms, so I was curious to see how the MM12s’ ring radiator tweeter would work in the Foo Fighters Studio 606’s large (25×29 feet, 21-foot ceiling) control room. John Lousteau, the chief engineer at 606, was kind enough to help set them up and patient enough to go on a sonic journey with me. The first thing we noticed was that the MM12s, while not bulky, were very heavy, weighing 132 pounds each. We followed Barefoot’s advice and had them ship their custom stands, which are height-adjustable. We set them up in a vertical position, approximately six feet from the center point in front of the Neve 8028. The bottom edge of each speaker sat flush with the top of the Neve, about two feet back from the edge of the console. We placed each speaker at about a 60-degree radius from the center position. the snare drum grace notes, the drum transients seeming to fly out of the speakers, the clear ringing harmonics from Billy Corgan’s guitar as the song begins to build up to a wall of sound. When Billy’s fuzz pedal kicks in, the super-sweet saturated fuzz guitar tone had possibly the clearest sound I’d heard since I recorded it: all the frequencies I’d labored over many years ago came blissfully pouring out of the speakers, not hyped, not missing anything, but exactly as I remembered we wanted them to sound when we recorded them 20 years ago. As I flipped back and forth between the Flat and Hi-Fi settings, I could really hear the difference in midrange detail. In Hi-Fi the guitar tones sat slightly back, reminding me of when we mixed the album on KRK near-fields. In the Flat mode the mix sounded a bit more aggressive, with the guitars becoming the prominent focus. When I flipped between the Old School and Cube settings, the midrange balance sounded remarkably like the pair of NS10s and Auratones I used to own at Smart Studios. Next up was also a blast back to my past: I had A/B versions of all the mixes that Andy Wallace and I did for Nirvana’s Nevermind. I had to adjust the levels a bit to get my un-mastered mixes up to Andy’s level, but once I did that it was really easy to hear the tonal differences in the mixes. Andy’s versions sound amazing, and that’s what the world knows Nevermind to sound like, but on the MM12 it was interesting to hear how different the drums sounded on “Smells Like Teen Spirit”: Andy’s mixes had a crisp attack. I could hear the compression on the room mics and reverb tails. In my mixes, Dave Grohl’s drums had much more midrange, they were dryer so they had bit of an “indie” sound to them, and Kurt Cobain’s guitars were thicker and beefier than in the final mixes. Both versions sounded great, but quite different. In the past, when I compared these mixes on other speakers, I was not able to hear the tonal differences that clearly, but now as I flipped between the different voice emulations I heard just how revealing the MM12s were. The song is pretty simple musically, but the vocal overdubs get denser as the arrangement builds, and I was thrilled to hear all the detail in the mix: the subtle shades of his phrasing, the tonal quality of each different range he sang, the emotional push he gave as the song developed. I tracked this record on the MM27s, and hearing it now on the MM12s gave it an entirely new sound. I could hear more detail in Chris’s phrasing, the space in the room as the vocals and piano notes tailed off. In fact, the whole mix sounded more three-dimensional to me—unbelievably gorgeous. Next, I wanted to hear some new technology: synths, beats, guitars and deep bass. I cued up one of Garbage’s new works-in-progress. The track is very dense, featuring a lot of synths, but also a fair share of guitars, electric and Moog bass, and several dynamic scene changes. One of the first things I noticed was how well the MM12s handled the bass and dynamics. In several sections of the song there is a synth bend that starts on D2 and bends down a whole octave over two bars to approximately 36 Hz. The MM12s sounded tight and focused all the way down. I didn’t hear any distortion or dips in the frequency response. I was also impressed with the MM12s’ ability to reproduce the extremely loud dynamic of the choruses. The speakers were easily able to handle the heavy balance of synths, sub-bass, live drums and sampled beats, and I could hear more definition between the tonal balances, especially on the top end, where I could clearly hear the separation on the live and programmed cymbals more than I could at home on my MM27s. I changed my position a lot while listening to the track, moving to the back and sides of the 606 control room, and was pleasantly surprised to find full-range sound even as I moved farther off-axis. I’ve been working on this track at my home studio on my MM27s and it was interesting to hear how revealing Shirley Manson’s voice sounded on the MM12s. I was able to hear more of the ”air” on her vocal in the quieter passages in both the Hi-Fi and Flat settings. Her vocal on the choruses was recorded through a stompbox with varying degrees of harmonic distortion, and the midrange detail, especially in the Flat setting, was very accurate: When she sings low in the chorus, I heard the harmonics just barely breaking up, but when she pushes her voice in the bridge, I sensed all the fuzz overtones in what sounds like breathtaking Technicolor. Finally, I’ve been recording demos with the Foo Fighters at Studio 606 over the last several months, keeping them very simple, live takes with the occasional vocal overdub by Dave Grohl. They are very raw. But as I’ve made changes in the mix balances, even a half-dB, I’ve been struck by how I can hear those minute changes in many different environments: my lo-fi car system, headphones, even my laptop. In the Flat setting, the MM12s have been very revealing for making changes to the Foo’s three-guitar attack, but I’ve found that if I mix in the Hi-Fi setting, the slight midrange dip makes me push the guitars up louder than I would in the Flat setting, the result being that the guitar riffs sound pleasantly aggressive when I listen outside the studio. The MM12s are the most accurate and revealing speakers I have ever worked with. I don’t consider them to be “hyped” sounding, even in the Hi-Fi mode. The midrange is extremely clear and flat, very much like the MM27s that I am accustomed to working on. I found myself listening most of the time in the Hi-Fi setting, and, to my ears, the MM12s sound big, open and extremely dynamic. While recording, when I was making critical EQ decisions I almost always deferred to the Flat setting, but found myself mixing on all four voice-emulations, flipping between them to get different perspectives. To put it bluntly, I think Barefoot Sound has come up with a new standard in high-end monitor design. Butch Vig is a producer/musician based in Los Angeles and thanks John Lousteau at Studio 606 and Mike Murashige for all their help with this review. PROS: Accurate and revealing monitors with clear and flat midrange. CONS: Too pricey for some.